BEER, Wilhelm and Johann Heinrich MÄDLER. Mappa Selenographica. Berlin: S. Schropp and Comp. 1834. Our latest catalogue the History of Ideas is now available to view online. Please click here for the first chance to order from the list! The catalogue covers a diverse range of subjects including science, engineering, mathematics and the arts. Arguably one of the most interesting items in the catalogue is Mappa Selenographica, the first edition of the first exact map of the moon. 103 x 103cm, four linen-backed quadrants mounted in twelve folding panels in custom-made blue cloth boards; lithograph map at a scale of 38 inches to the lunar diameter; splits in linen backing along centre folds, not affecting map, spine worn, very good. Provenance: with rare prospectus in French with library inkstamp of Royal Institution of Great Britain to top of front page, with another inkstamp to the rear of one panel of the map itself. First edition. Rare. 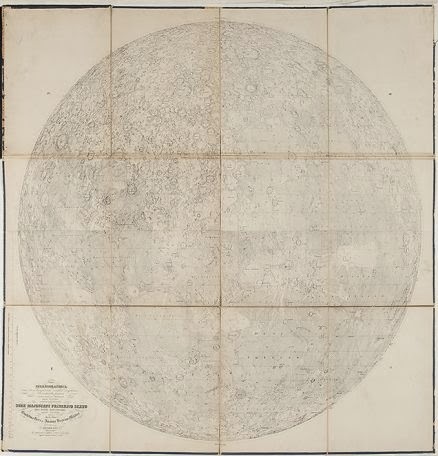 This was the first exact map of the moon and remained the standard for many decades, until Schmidt's more detailed map of 1878. Beer and Mädler's observations were made using the former's 9.5cm refractor at his private observatory in Berlin and represent an important step forward in the interpretation of the moon. They established the modern practice of of designating secondary craters by assigning to them a letter associated with a nearby "parent" crater, and of labeling them on the map by placing the letter on the side facing the parent. The method of issuing the map in four numbered quadrants was also followed by many subsequent lunar cartographers. The map is printed with the south of the moon at the top, which was common practice at the time. The map was followed by a book, Der Mond (1837), which contained the pair's precise measurements and formed the basis of later maps by several other cartographers. It is difficult to overstate the significance of this map in the history of lunar research, and this copy has the added importance of having been held at one the world's greatest scientific institutions. Honeyman 267; DSB I, p.568f: "(...) their chef d'oeuvre (...) the best map of the moon produced in the first half of the nineteenth century (...)."